There have been plenty of advances in the grilled cheese arts around Philly, but my awakening goes back to the first time I happened upon Verna’s truck in Fishtown. This was years ago, and I’ve still only gotten one thing from her: the pulled pork grilled cheese. And it’s exactly what you’d expect: a grilled cheese sandwich piled with pulled pork. Nothing fancy. Just amazing. The sandwich certainly makes perfect drunk food, but it’s also a great meal any other time as well. Whether they’re parked on a corner in Fishtown, at Love Park, or at the top of the Mann for a Phish show, there is no wrong time or place to order this. The cheese is gooey and makes the strings you’d expect fall off of each bite, while the pork adds an unctuous backbone to the sandwich, with a tangy BBQ sauce that cuts through all the fat and heaviness to trick you into thinking you’re not actually taking in a boatload of calories. But don’t let the calories dissuade you. You can burn them chasing down the truck, and then you won’t have to worry about them. Not that you should—this sandwich is worth every damn calorie. Follow Vernalicious on Twitter at @Vernalicious1 to find out where she’ll be next. 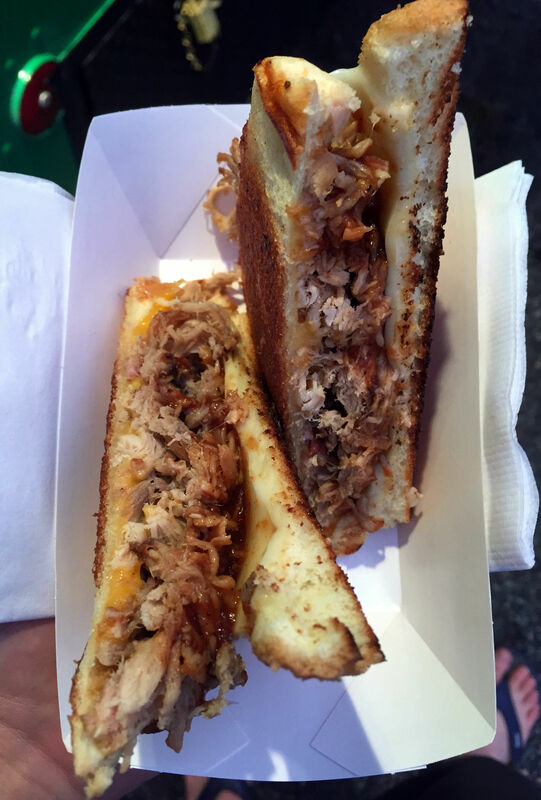 This entry was posted on August 17, 2015 by Ryan in PHL Favorite and tagged food truck, grilled cheese, phl favorite, pulled pork, vernalicious.